Cambodia's King Norodom Sihamoni is greeted by Prime Minister Hun Sen during the celebration marking the 64th anniversary of the country's independence from France, in Phnom Penh, Cambodia, Nov. 9, 2017. Cambodians will now be constitutionally obligated to “defend the motherland” and forbidden from insulting the king under a number of new legislative changes that observers say suggest a prolonged assault on civil liberties in the country. 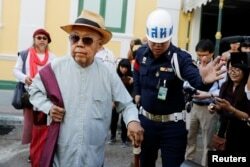 Sulak Sivaraksa arrives for a court hearing where Thailand's military prosecutor will decide whether to proceed with a lese majeste case against him, in Bangkok, Thailand, Jan. 17, 2018. Sam Sokha, who threw a shoe at a billboard depicting Cambodian Prime Minister Hun Sen, stands in police station in Phnom Penh, Cambodia, Feb. 8, 2017. 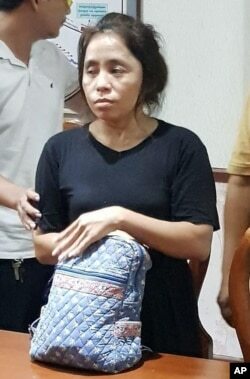 Sam Sokha has been arrested after being repatriated from Thailand where the U.N. refugee agency reportedly had formally recognized her as a refugee.